Named after the city of the legendary Trojan War, Troy Ohio was created in 1808, just 5 years after Ohio became a state. 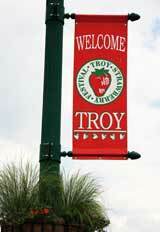 In fact, residents of Troy call themselves Trojans. Due to its strategic location on the Great Miami River and later the Miami and Erie Canal provided for rapid growth in the new community. 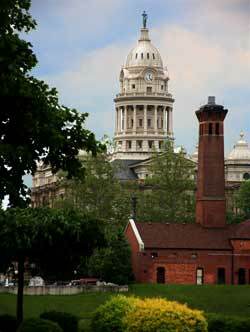 Today, Troy is the seat of government for Miami County. Miami's Pride is what they call the county courthouse that can be seen from almost anywhere inside the city limits. It is a majestic 3-story Neo-Renaissance style of architecture that is 183 feet tall with cast iron domes and copper statue of justice at the top. It was constructed in 1888. The court house is located at 201 W. Main St. The interior of the county courthouse shows decorative detailing includes highly colored encaustic floor tiles, plastered ceilings and archways ornamented with representations of local agricultural produce. The Troy Strawberry Festival is one of the larger annual events held in Troy and regularly draws crowds of 150,000. Usually held the first weekend of June, the main area of the festival is held along the levee on the north side of the Great Miami River, but events also go on at Memorial Stadium next to the levee as well as Hobart Arena and several city parks. The main stars of the festival are the delicious strawberries that come in many shapes, sizes, and concoctions. Don't forget to check out the town square fountain that turns red during the festivities. 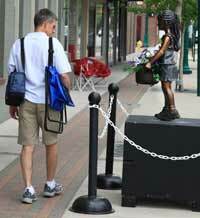 The bi-annual event puts unique works of art on display on the streets of historic downtown Troy. Make plans to spend a day shopping and dining at our fine restaurants and unique shops, and stroll the streets viewing the sculptures. The exhibit will be on display from early May through mid September. 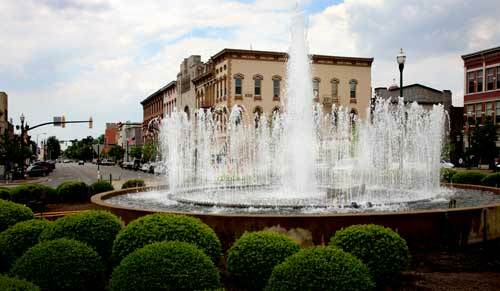 Troy was voted as one of Ohio's 5 Best Hometowns by the readers and editors of Ohio Magazine in 2009. The WACO Aircraft Company of Troy was the leading aircraft manufacturer of civilian aircraft in the U. S. from 1928 - 1935. The company began as the Weaver Aircraft Company in Lorain, Ohio in 1921. After moving to Troy in 1924 the company changed its name to Advance Aircraft Company but kept the WACO logo and then in 1929, the name was officially changed to simply the WACO Aircraft Company. WACO produced over 80 models from 1919 - 1946, including the large troop carrying gliders used in all the major invasions during World War II. In 1978 the WACO Historical Society was formed to preserve the history of not only the WACP Aircraft Company, but also to serve an educational vehicle. The organization also has a museum that features a WACP glider, a replica of the 1902 Wright Brothers Glider and numerous other aviation artifacts, photos and exhibits. The museum is housed inside what appears to be a working hangar. In the spring of 2010 the WACO Air Museum and Aviation Learning Center is moving into a new building when it opens in the Spring. Some new aircraft that had been in cold storage since the defunct Flight Museum at Port Columbus closed its doors in 2000, will be added to the Learning Center's inventory. A 1926 WACO 9 and a 1928 WACO 10 have been in the possession of the Ohio Historical Society, but not on display. The Society is loaning the aircraft to the Learning Center. Wednesdays 5:30 p.m. - 9:30 p.m.
Saturday and Sunday 1 p.m. - 5 p.m. Known worldwide in the food preparation industry, the Hobart Manufacturing Company was founded and still located in Troy Ohio. The company which started as the Hobart Electric Manufacturing Company was founded in 1897. In 1913 the company reorganized and expanded its product line to include commercial food processing mixers, coffee mills, and meat choppers.